This grand 195 mile route from Manchester through the Midlands, and on down to the gateway to the West, Bristol. You may either tackle this one as an individual keen cyclist, ready for 2 big days, or you may wish to break it down into smaller legs, and ride as a relay team - the choice is yours! Cutting the edge of the peaks, passing Stratford Upon Avon and riding over the Cotswolds, this is a memorable ride indeed! This ride covers a large swathe of the middle of our country and connects some of our proudest and most historic locations. 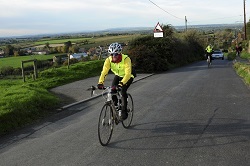 Be ready to experience the Heart of England in a new and exciting way, seeing every turn in the road and every countryside vista as you pedal this fantastic route. Also be aware that you will be riding in and out of the three cities of Manchester, Birmingham and Bristol. The ride will cross some flat areas, but also considerable areas of undulating terrain, so you had better get busy with your training! The more training you do , the more you will enjoy this fantastic ride, and the less you will be wondering just how many miles are left to go!!! Day 1 Manchester — Birmingham , apx 95 miles. Early departure from Manchester (by 08:00 absolute latest). Chosen route takes us through the historic town of Macclesfield, and onwards via the edge of the Peak District and down into the Midlands. We shall make our way via Cannock Chase, on small roads wherever possible (please request more detailed road maps) and to the outskirts of Birmingham. The total distance for today is some 95 miles, and will give everyone a challenging day! Day 2 Birmingham - Bristol, apx 100 miles. Riding out to Stratford upon Avon, and then down towards the beautiful Cotswolds. In the afternoon we shall make our final approach into Bristol, arriving in the early evening - just in time for a great celebration in Isambard Kingdom Brunel's home city. Raise a glass to a job well done! Manchester to Bristol, now what's your next challenge? This challenge does not include accommodation - we have left you to decide upon which style of accommodation you prefer. Full Vehicle Support and Driver/Mechanic/First Aider. Expect it to be potentially chilly at times—and maybe even a little rain. If we prepare for all conditions then we may be pleasantly surprised! Hat and gloves are highly recommended for this trip! Bring warm tracksuit trousers just in case.